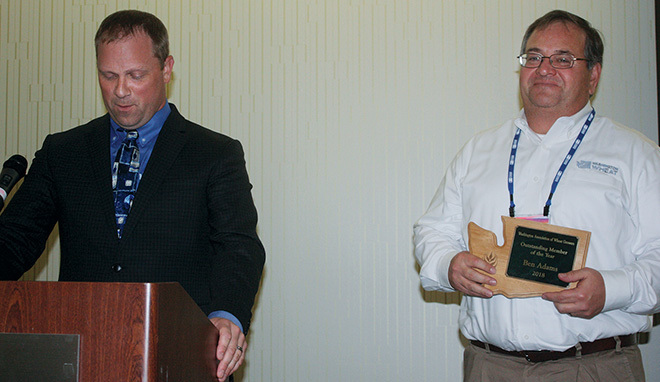 In one of his first acts as the new 2018/19 Washington Association of Wheat Growers (WAWG) president, Jeffrey Shawver (left) awards Douglas County grower Ben Adams WAWG Member of the Year at the 2018 Tri-State Grain Growers Convention. Nearly everything came up smelling like roses at last month’s 2018 Tri-State Grain Growers Convention in Portland, Ore., where approximately 300 growers, stakeholders and industry representatives gathered to hear the latest updates on issues and socialize. The location of this year’s convention offered some unique opportunities for convention attendees: A tour of the Wheat Marketing Center in downtown Portland and a Vancouver Export Terminal tour. The tours filled up quickly, and participants had a fun, educational experience. Another highlight of the convention was the keynote presentation by former U.S. Army Ranger, Keni Thomas. Thomas used his experience in a fire fight in Somalia (later recounted in the book and movie, “Blackhawk Down”) to talk about how and why people can step up to become leaders and define success. One of WAWG’s primary tasks at the convention is to review and revise the organization’s resolutions, which help direct leaders and staff. See a list of the new and changed resolutions on page 14. The full resolutions are available on WAWG’s website at wawg.org/about-us/. During the all-committee meeting, WAWG members heard farm bill updates from the National Association of Wheat Growers, as well as updates from the Risk Management Agency, the Farm Service Agency, the National Agricultural Statistics Service and the Natural Resources Conservation Service. Two new ambassadors were awarded scholarships: Lacey Miller of Ritzville and Evan Henning of Thornton. Read more about them here. Outgoing Washington Association of Wheat Growers (WAWG) president, Marci Green, named Benton County as the WAWG County of the year at the 2018 Tri-State Grain Growers Convention. The award was accepted by county vice president, Anthony Smith. A plethora of awards was handed out during the annual state banquet. Amid much clapping and hollering, Benton County was named the county of the year. Anthony Smith accepted the award on behalf of his county. 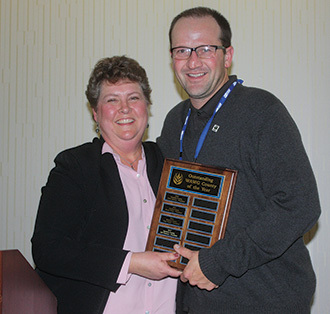 WAWG member of the year was given to Ben Adams, a former WAWG president (2016/17) and a farmer from Douglas County. In one of her last acts as president, Marci Green exchanged ties with Rich Koenig, interim chair of the Department of Crop and Soil Sciences at Washington State University (WSU), an annual tradition that symbolizes the “ties” between WSU and the industry. As Green’s year as WAWG president came to a close, she took a moment to thank family, friends and WAWG staff, saying “it takes many teams” to make the organization run smoothly. Franklin County grower Jeffrey Shawver takes over as WAWG president, while Grant County grower Ryan Poe steps into the vice president’s role. Howard McDonald, a grower from Douglas County, will become the new secretary/treasurer. Bridget Blom, Lonnie Green, Jim Moyer, Charlene Flanigan, David DeGon, Larry Wilcox, Gene Classen, John Schlomer and Donald Walker were the LAF drawing winners. The staffs of Oregon, Idaho and Washington would like to thank all the members and industry supporters who attended this year’s convention. Feedback is always welcome, and planning is already underway for next year’s convention, which will be held in Spokane, Wash. See more pictures from the 2018 Tri-State Grain Growers Convention in December’s Wheat Life.